Servants were hard to come by in 19th- and early 20th-century New Zealand, despite being offered subsidised passage from Britain. Because of the servant shortage, many women had to learn how to do their own cooking and cleaning. Getting in household provisions was aided by home delivery of meat, milk and other groceries. Many women who settled in New Zealand in the 19th century worked as household servants. In England at the time, the upper- and middle-classes expected to have servants, and so well-off settlers in New Zealand did too. Because there was a shortage of servants, governments paid part or all of their fare to encourage them to come to New Zealand. Even so, there weren’t enough servants to meet the demand, so many settlers had to do their own housework. Servants were paid badly and worked long hours. Often they only had half a day off a week. Most servants tried to get other jobs, or got married. Fewer people worked as servants in the 20th century. 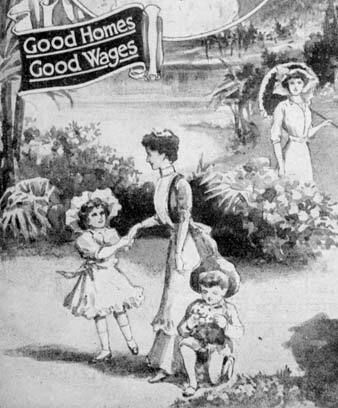 In the early 20th century cooking and home science were introduced into the school curriculum for girls, as they would often have to do housework for their families. From the 1970s more women worked outside the home, and people began employing housecleaning services. The first professional gardeners in New Zealand had usually trained in England. Some worked on large country estates, but many started nurseries or landscape-gardening companies. Some gardeners also did other household work, such as milking cows. Before most people had cars it was common for them to have groceries and other goods delivered to their houses. Home milk deliveries continued until the 1990s, but died out after milk could be sold in supermarkets. Since the late 1990s some supermarkets have introduced an internet shopping service, and deliver groceries to buyers’ homes.